Ryukyu Glass is a Japanese glass handicraft, made in Okinawa prefecture. Ryukyu Glass started from postwar days. At that time, because of shortage in glass materials, craftsmen used varieties of waste glasses like bottles of Coca-Cola thrown out from U.S. bases, and produced colorful and unrestricted works. Using reproduced glasses, by any means bubbles are contained into their works. Usually, glass crafts containing bubbles are regarded as defective works. However, craftsmen of Ryukyu Glass used bubbles as one of the techniques of expression to describe their beautiful sea. Bubbles in Ryukyu Glass seem like bubbles in the beautiful sea of Okinawa islands. 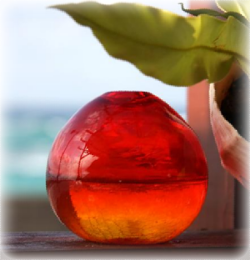 Nowadays, craftsmen succeed in making colorful and warm glass handicrafts fitting the exotic atmosphere of Okinawa. Some of craftsmen developed their skill to the artistic level, such as Inamine Seikichi, Masao Tobaru, Koei Oshiro. Mr. Seikichi Inamine makes his works with mixing glass and clay, and his glass works may remind you of ancient marbles or something.